Incredibly the summer is almost over. I’ve had a blast working at Little River Outfitters this summer. The staff here is top notch and great to work with. Getting to fish every day (or almost) was not a bad way to spend a summer. Wapsi Hell was a recurring theme that is simply part of keeping all you fly tiers in materials (me too come to think about it). Speaking of the customers, that has been one of the greatest parts of the summer. Thanks to everyone that has stopped by to see me and to those that I was able to meet for the first time. I’ve met some great people from across the country including folks from Ohio, Indiana, Michigan, Florida, Alabama, Mississippi, Georgia, Kentucky, Nevada, and California (and others that I’m forgetting). I want to thank all the great people I’ve met who invited me to join them on their home waters in the future. If you’re one of those people be careful, very, very careful…I might actually take you up on the invitation sometime. Most of all I want to thank the great people at Little River Outfitters for giving me one of the best summers I could ask for. The opportunity to work for one of the top fly shops in the country was an honor and much appreciated. This summer has flown by and I can’t believe it is almost over. For my last weekend here in Townsend, my cousin and his girlfriend came up to visit. They spent Friday night backpacking above Elkmont and got pounded by the storm that came through early Saturday morning. We had agreed to meet at the trailhead to go sightseeing and/or hiking on Saturday so at the appointed time I drove up to find them soaked but in good spirits. The drenching the park received did wonders for the streams. First on the agenda for the day was a drive up to Clingman's Dome. We stopped off at Sugarlands and left one of the vehicles there before heading on up the hill. On the way it became apparent just how much rain had fallen. The West Prong of the Little Pigeon River was rolling and the water was stained. Fog still enveloped the highest peaks providing a perfect example of how the park got its name. Shortly after passing the Chimney Tops trailhead I stopped the car and we piled out for a brief photo session. As you can see, the stream had plenty of water to go around. All the little tributaries pouring off of Mt. Leconte were near bankfull. The clouds had been lifting steadily all morning as the atmosphere slowly warmed but the higher elevations were still socked in. At Clingman's Dome we were treated to something different than what we had come for but still provided some interesting photo opportunities. The clouds were rolling up over the mountain sometimes cutting visibility to 100 feet or less. On the walk up we found some wildflowers that were just now reaching their peak at this high elevation. At the summit we enjoyed the cool moist air that felt more like fall than summer. After walking back down to the car we decided to drive over to Cataloochee and check out the elk. Since I have never been through the Cosby and Big Creek area of the park we decided to take the scenic route through that corner of the park. A couple of hours later we rolled into the magnificent Cataloochee Valley and quickly found the animals we were looking for. I even caught a couple of fish and the late afternoon light provided for some interesting pictures. By the time we reached Cataloochee we had made half of a loop so the day would not be complete without finishing. We drove around to Maggie Valley and then towards Cherokee. When we reached the top of the ridge between the two towns we caught the Blue Ridge Parkway which took us back into the Park near the Oconaluftee visitor center. The drive over the ridge completed the loop and after picking up the second vehicle we headed to my cabin for the night. Sunday morning was great, mainly because I slept in for awhile and then we had a big breakfast. After my visitors left I went fishing for what will probably be the last time in the Smokies for awhile. I just had to fish a favorite section of Lynn Camp that I still had not fished yet this summer. The fishing was appropriately spectacular with plenty of fish coming to hand in the 2 or so hours I spent on the water, a perfect end to a summer of fishing in the Park. Apparently everyone is fishing Scientific Anglers fly lines. I have to admit that I've fished them myself for several years. 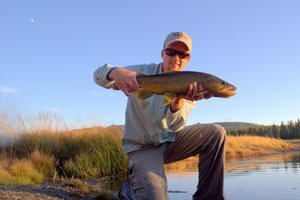 This summer I made the switch to a Rio Gold line for my 5 wt rod and so far I love it. My upcoming trip west should give me more opportunities to really give the line a workout so we'll wait and reserve judgement until the line has accounted for some monster trout. The results were split fairly evenly between the other line makers except I was surprised that there was only one vote for the Wulff lines. I've heard a lot of good things about there lines but haven't fished them myself. Anyone want to let us know why they particularly like the Wulff fly lines? With my summer in the Smokies drawing to a close, my chance for a weekend backcountry trip was quickly vanishing. I decided to take advantage of the last weekend that I had free to hike into Deep Creek. After work last Friday, I drove over the hill and hit the trail around 6:30. Two hours later I was far down the trail at campsite #54. After setting up the tent I crawled in and fell asleep, tired from the fast trip down from the ridge. The next morning was perfect and I had a leisurely breakfast in camp before wandering down the trail to see what was in the creek. I was surprised by the condition the trail was in. Apparently it doesn’t get much traffic because the upper 6-7 miles of the Deep Creek Trail had places where it was overgrown by the surrounding vegetation. Sometimes the trail almost disappeared but if you pressed on it would always open back up. After walking downstream awhile I finally hit the water with no idea what to expect. Things started out okay but not great with several small rainbows and browns coming to hand. One pool in particular was puzzling. The best water seemed devoid of fish. It was one of those spots where I expected a better than average fish but instead got nothing. Things made more sense as soon as I hit the pocket water above the pool. Apparently the best fish had moved up into the faster water to feed. 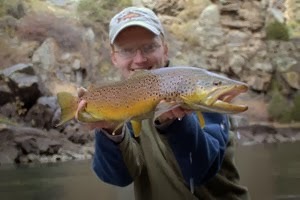 I hooked 3-4 fish and landed a couple before reaching a nice plunge pocket a good hundred feet upstream from the pool. My first couple of casts didn’t produce anything so I maneuvered across the creek to get into a better casting position. My first cast from this new spot produced a hard hit and clean hookup. My heart leaped into my throat as what appeared to be a decent fish torpedoed past back down towards the pool. The next few minutes were undoubtedly the toughest battle I’ve ever had with a fish. At first glance I figured it was probably a 15 inch or so fish but it seemed awfully heavy. First it ran behind a rock as I stumbled along in pursuit. I soon brought it out before it ran downstream again with my reel singing. Soon it took up residence under another rock and this time I was sure I had lost it. The occasional shake on the end of my line assured me I still had a chance and after some serious prodding in which I almost jumped in and reached under the rock, the fish bolted again. This time it ran all the way down into the deeper water of the pool where I was sure it would break me off on some of the ledges. It must have been my day though and my equipment and nerves stood up to every challenge the fish offered up. Soon I had it corralled in the shallows for a couple quick pictures before I watched it swim back into the pool. 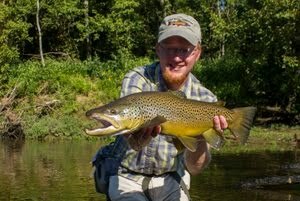 This was most likely the fish of the summer in the Smokies for me. I estimated it at quite close to 20 inches and later found it was between 19” and 20” based on the pictures. Still not a legitimate 20 incher but still one of the best fish I’ve caught in the Smokies and definitely a high point of the summer. Further fishing provided steady action on more average fish but no more monsters. This trip was definitely a blast and allowed me to make another visit to one of my favorite streams in the park. I hope to head back again sometime in the upcoming months, but school has a way of ruining the best of intentions so I can only keep my fingers crossed. Besides the nice fish, this trip was worth the effort because of the great scenery. I found a lot of beautiful flowers streamside including rhododendron among other things. The stream itself was in great shape. That particular drainage doesn’t seem to be suffering as much from the drought as compared to the Tennessee side of the park. The one surprise was the lack of insect activity. There were lots of midges and other tiny bugs on the water but not much else. The fish didn’t seem to care though and were feeding well. Softhackles dropped behind a Tellico produced the best action although fish were eating dries willingly as well. I finished reading it quite some time ago and finally made the time to write this short review on “The Fly Caster Who Tried to Make Peace with the World,” by Randy Kadish. Originally I intended to read a little each night and finish this book sometime near the end of my time here in the Smokies. The idea behind this being that it would provide some entertainment each night as I enjoy reading nearly as much as I like to fish. In the end the idea proved to be a bad one, mainly because this book held my attention more and more the farther I got. I ended up finishing it in about three evenings of staying up much later than I should have. It was just impossible to set down. The title sums up the theme of the book. Ian uses fly fishing as an escape from the ugliness of the world around him. It was his way of getting away from everything else and enjoying the beauty of nature which soothes the soul. Fly fishing is my way of relaxing. Even when I’m at school and have an important paper or project, a few hours on the water allows me to leave it all behind and forget the stresses of everyday life. This book is not only about one single character however. Randy Kadish intertwines the lives and stories of some of the leading pioneers in American fly fishing to produce a thoughtful and entertaining story. The title informs the reader of the struggle going on in the leading character with the sometimes ugly world that we all see. However it is often as much a struggle with the world as it is within himself. Fly fishing seems to be as much an escape from himself as from the world around. Ian desires to be the greatest distance fly caster. The book revolves around his journey from beginner to expert caster. Life brings sadness and suffering but also joy. In the end, Ian faces all his disappointment and hurt from the past and enters one last fly casting tournament. This moment is not just a chance to be the best fly caster but almost seems to be the chance to prove himself. Sometimes in life there are things we feel like we have to do even if we don’t know why. Ian Mac Bride had basically given up distance fly casting but in the end felt the need to try one last time to win a distance tournament. This book was a great read. The only complaint I have was something that bothered me early on but not as much later on in the book. The storyline seemed to jump between two distinctly different plots. The main plot of course was about Ian Mac Bride and the other doesn’t really seem necessary to the book. However, when all was said and done it didn’t really detract from the book. As I already mentioned, this book is very easy to relate to. The leading character goes through many of the same struggles and experiences many of the same heartaches as the rest of us. Despite the story being set in the early age of American fly fishing many years ago, it still speaks to the reader. If you enjoy a theme of fly fishing woven into fiction then this book is worth checking out. Everyone that visits the Smokies has a different experience in the park. Some drive hesitantly to the visitor center at Sugarlands before retreating back to the comforts of Gatlinburg. Others drive to Cades Cove and take in the views via the 11 mile loop road. A few get off the pavement and into the real park. Those that do are rewarded with an ever-changing landscape that always impresses. This weekend brought more much needed rain to the Great Smoky Mountains. Yesterday I awoke to the sound of rain drumming on the roof and knew it would be a good day to go fishing. After a leisurely morning I finally made it out onto the stream by early afternoon expecting to find the water stained from all the rain. Instead the streams were in great shape with very little color in the water. Unfortunately the sun had come out by the time I started fishing so I didn’t expect too much out of the day. Surprisingly, the first place I stopped at provided some consistent fishing, much better than I thought it was going to be in fact. The best fish at this first location was a 10 inch rainbow that put a good bend in the 4 wt. The top producer early on was a soft hackle Isonychia pattern I tie although a Prince or similar nymph would have worked well also. After fishing all the way through the section I was on, I decided to head farther upriver to see what was happening. 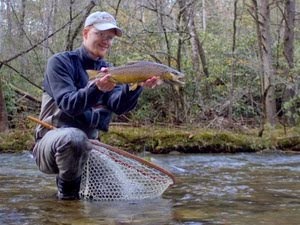 I eventually ended up hiking up Little River above Elkmont and found some more good fish including a 13 inch brown that I caught as a storm was pounding the Little River watershed. Despite the rain coming down and occasional flash of lightning, I still managed a quick picture before watching the fish swim away. With the storm continuing it seemed like a good time to turn around and head for the car. Soon the rain increased to the point where the trail was as much a stream as the one it followed. There were several nice runs in the trail that almost appeared to be fishable. I avoided the temptation to try and catch a trail trout, and kept hustling back to the dry car. Soon I emerged from the dripping woods bearing a strong resemblance to a drowned rat. Thankfully there wasn’t anyone around the trailhead to laugh at my bedraggled appearance. As I head into another week, its time to start deciding what to do next weekend. I’ve been wanting to do a backcountry trip before the summer is over and this would seem to be the best weekend. On the other hand it would be nice to try the Caney again. Anyone have any suggestions? Our new poll is about fly lines. I'm wondering which brand everyone prefers to use. Personally I've been using the SA Mastery Trout lines for awhile but decided to try out the Rio Gold on my 5 weight. So far it has only seen action on the water once, but it seems like a good line. So, what brand are you using the most? The month of June ended with two days of fishing for me. Sunday I fished the Caney Fork along with everyone else in the state of Tennessee and also those that are flocking here from other states to partake of our excellent fishing. That river is a total madhouse on weekends, and I suspect it is staying fairly busy on weekdays as well. With the odd generation schedule lately, wadeable water is hard to come by making the few places where you can effectively wade excessively crowded. I probably won’t fish it much more until the weather cools and some of the crowds start to diminish. Despite the crowds the river is still fishing extremely well. I broke off two large fish and am starting to think that I’ve somehow been cursed when it comes to catching big fish. 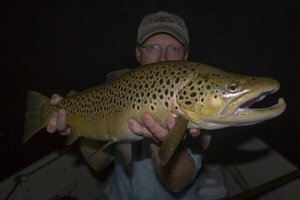 I’ve either stung or hooked and lost some very nice fish each of the past several times I’ve been on that river but have yet to actually land one. Hopefully all the missed fish will add up to some good luck in the future. The interesting side note to the day occurred while fishing up near the dam when I heard a noise off behind me. I turned around to see an animal ambling along up the shore in my general direction. After doing a double take I verified that, yes indeed, it was a raccoon. Seeing these things out wandering around in broad daylight always makes me a little nervous about their health and well-being but this one acted basically normal I suppose. Monday evening again saw me on a stream, this time Little River here in the Smokies. After I got off of work at LRO, I grabbed a snack and headed up into the park to see what was going on. Driving slowly up the river, I took the time to stop and sample several spots above Metcalf Bottoms and finally ended up above Elkmont for the evening finale. The fishing is still holding up and should actually be excellent for the next several days as we go into the Fourth of July holiday weekend. Most trips are yielding some better than average rainbows up to 10 inches and even slightly larger. The weather forecast holds some good news as well. Starting this weekend we should have a chance for showers and thunderstorms for several days. Every little bit helps and will keep the fishing good.